Mathew (boo) Hintz has used his talents and created a piece of Sturgis history for Harley-Davidson Motor Company. Within the early planning stages of the Sturgis 75th Anniversary, Harley Davidson knew they had to do something special to help commemorate this event, so they looked at Mathew (boo) Hintz. With only a few small internal meetings, the decision was made that for the first time ever, Hintz and Harley-Davidson would produce a limited edition fine art print. 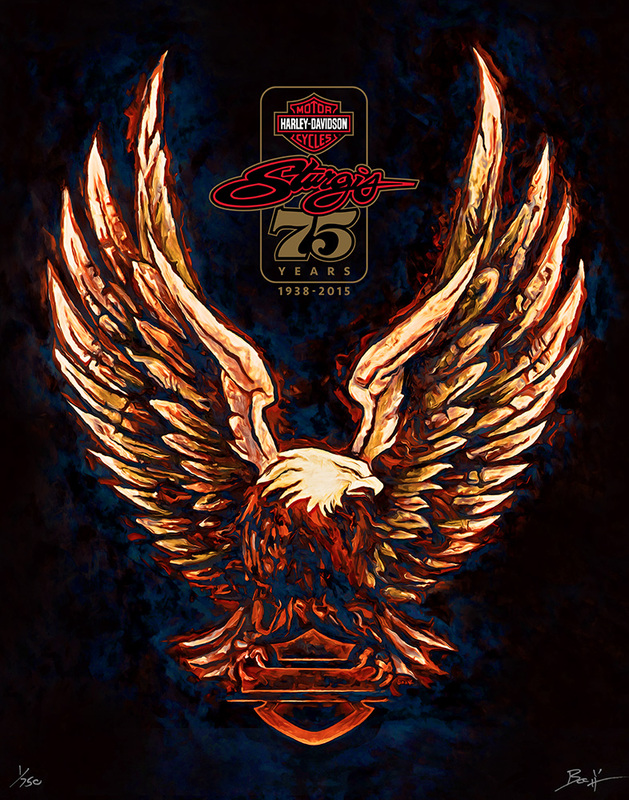 Hintz had just created the Harley-Davidson Sturgis 75th Anniversary logo for the company when he switched his focus onto his fine art. Hintz knew what imagery he wanted to paint, so he started painting the well known Harley-Davidson eagle in a larger than life scale of 60″ x 40″. The original painting took over 40 hours to create. 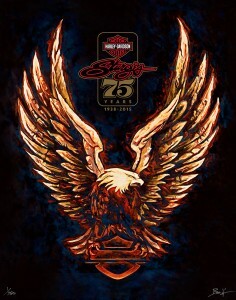 Hintz then spent hours in the computer to apply the Harley-Davidson Sturgis 75th Anniversary logo before he was finished. He presented his concept to Harley-Davidson and outlined a plan for marketing, the artwork was approved. With the artwork approved, Hintz then went to his printers to have them print a limited number of only 750 fine art prints. Each print was hand signed, numbered, and accompanied by a certificate of authenticity. Printed on high quality water color paper, they soaked up the inks, giving a rich and deep and high quality rendering of the artwork. The print and original painting both hold the title, Eagle 75. Hintz is not only humbled by his artwork supporters and motorcycle enthusiasts who feed his passion, he is thankful for the opportunity Harley-Davidson has given him. Please show your support and I hope you are lucky enough to own a piece of Sturgis History. Contact Hintz Studios for information on how to purchase your very own Eagle 75 limited edition print or the original 60″ x 40″ original painting.